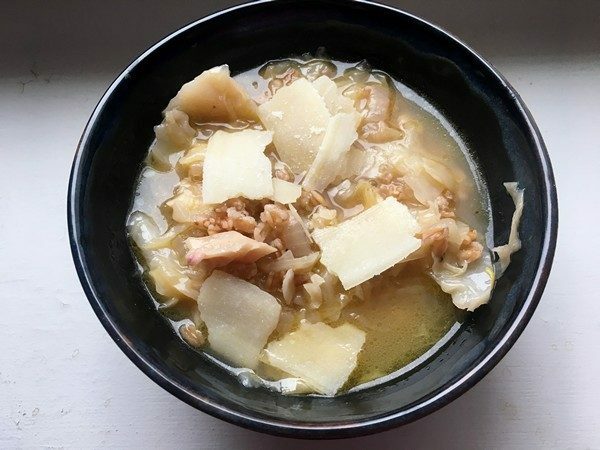 This cabbage soup was making the rounds of the Internet recently and everyone was raving about how good it was. It’s from Smitten Kitchen and serves 4. Cut out the cabbage core and finely chop it. Cut the leaves into 1/8” ribbons. Heat 1/4 cup olive oil in a large pot or Dutch oven over medium heat. Add the onion and cabbage core, salt and pepper, and cook, stirring frequently, until the onion starts to soften but is not yet browned, about 5 to 7 minutes. Add the garlic and cook another 3- 5 minutes, until the garlic softens. Add the shredded cabbage leaves and herb sprig, if using. Reduce the heat to medium-low, cover the pot and let it steam a bit to soften the leaves, then toss the cabbage to combine with other ingredients. 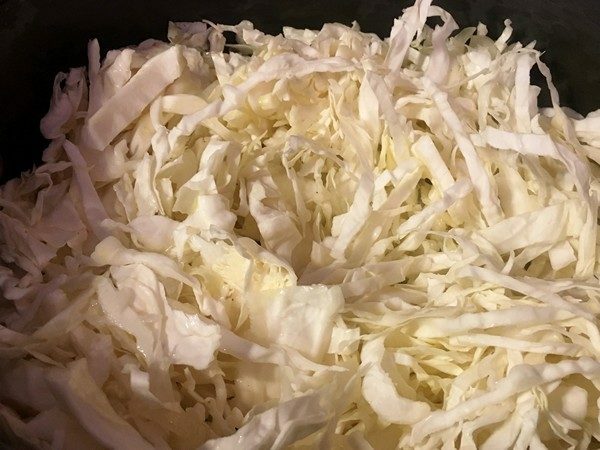 Cook, covered, until the cabbage is very sweet and tender,15-30 minutes depending on the type of cabbage you’re using. Stir occasionally. Meanwhile, in a small skillet, heat a glug of olive oil over medium heat and add the uncooked farro. Toast it, stirring, for a few minutes, until it’s about half a shade darker. When the cabbage is ready, stir in the vinegar. Taste and season with more salt and pepper. Add the farro and broth. 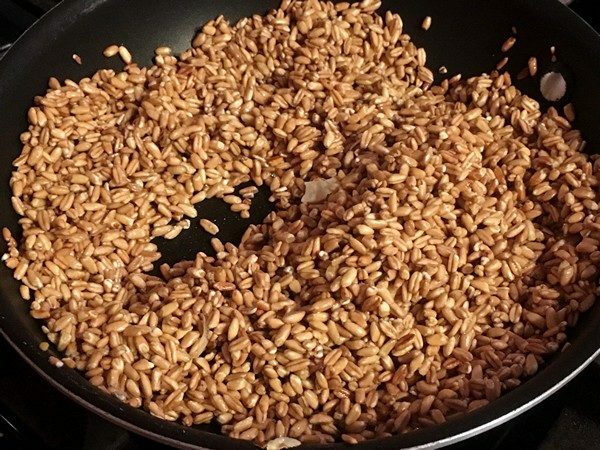 Bring mixture to a simmer and cook for 25 to 35 minutes, until farro is tender. The soup will be very thick, but if you’d prefer more liquid, add another 1/2 cup broth or water. Taste and adjust seasoning again. Stir in lemon juice. Ladle into bowls and finish each with a drizzle of olive oil and a shower of Parmesan, serve and enjoy! My verdict: Frank loved it, but I was disappointed in it. I had great ingredients, cabbage, garlic and onions from the farm, homemade chicken broth but it was a long process and in the end it was cabbage soup. As a friend said about a recent food event—meh. The original recipe comes from Six Seasons: A New Way With Vegetables which I happen to have on my iPad. He calls for meat or poultry broth and I’m wondering if beef broth would be a better way to go. I did add a couple of pieces of smoked pig skin (left from making bacon) for flavor, and used good homemade chicken broth, but neither took it into the realm of super deliciousness. Both recipes said it would be thick, but mine was pretty soup-like. Not sure what browning the farro achieved except dirtying another pan. Since I was on the fence about this, I gave it a time out and left it alone for a few days. Time made it thicker (the farro absorbing more broth) and a squeeze of lemon and some shaved parmesan gave it flavor. I’m still not wowed, there are better soups out there that come together faster. What do you think?